A preliminary design for a battle cruiser sent on 27 August 1915 to the General Board in response to a request to examine the feasibility of three sets of characteristics, all mounting the same main battery but varying in speed and armor. This plan was the only drawing developed for any of the three. Note that the plan appears to be a larger version of P.D. 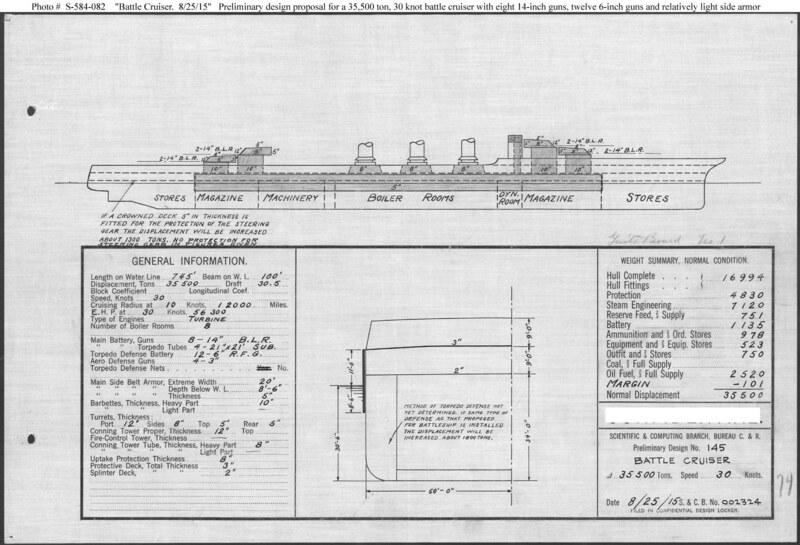 No.143 (see Photo # S-584-081), adding displacement to provide light side armor that made this new design appear feasible. The initial design adopted for the Fiscal Year 1917 battle cruisers (see Photo # S-584-102) resembled this one in armament and armor. This plan provides eight 14-inch guns, turbine machinery, and a speed of 30 knots in a ship 745 feet long on the waterline, 100 feet in beam, and with a normal displacement of 35,500 tons.